Rich in so many ways that it has taken me 3 weeks after returning from this trip to post about it because I hardly know where to start or stop. So I’ll start with what prompted me to create this blog….the celebration of even the smallest of treasures. 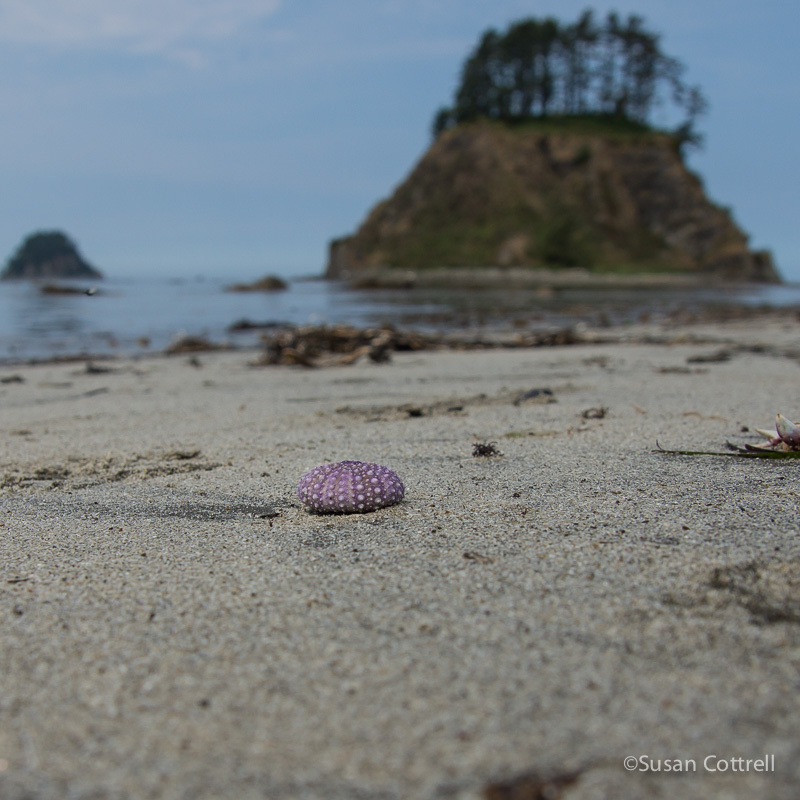 Sea urchin shell on the beach at Cape Alava. Tskawahyah Island in the background. I saw this little beauty when I paused from strolling down the beach to just take in all my surroundings. There it was, almost at my feet, barely an inch across, strewn amongst other tideline goodies. My trip this year was a return celebration of a birthday trip I made 20 years ago. I have been back a few times in between, but that first trip, and now this most recent trip are special in their own way. They were filled with friends and family that made the journey to celebrate with me at one of my favorite places. The richness, the abundance, the bounty, the history of this place continually amaze me and I am filled with gratitude for how rich my life feels and the abundance I experience in my life from places like this and from the community that surrounds me. Tskawahyay Island at Cape Alava, Ozette Indian Reservation, Olympic National Park. 01 Sep	This entry was published on September 1, 2014 at 12:58. It’s filed under Coast, Nature, Pacific Northwest and tagged backpacking, beach, Cape Alava, inspiration, natural history, nature, Olympic National Park, Olympic Peninsula, Olympic Wilderness, Ozette, Ozette Indian Reservation, sea urchin, tide pools, Tskawahyah Island, Washington coast. Bookmark the permalink. Follow any comments here with the RSS feed for this post. Sue, lovely to see your images and words. I too found this to be a special journey. It afforded more time to ‘just be present’ than I have had in years. I keep thinking I will make time to write and share my gratitude and thoughts with all of you that made the return journey. Instead I’ve been swept up by the wave of life that captures me each morning and returns me to rest on the sands each night. Paul sent me some photos from your 40th. You probably have them already, but they renewed memories for me. I’ll send them out some time. It will be a surprise! Thanks for sharing so much, so easily. It was a joy to be reacquainted with Cape Alava and friends. I have been looking through the original trip photos that Rose took. Beautiful memories! Thanks for being a part of this adventure again. I loved having you there! Very nice! The pictures capture the wonder of this place. Thanks for bringing us all together. It was a magical time. Thank you dear sister for your eloquent words on your blog!